VirTis Freezemobile 12EL Freeze Dryer Sentry 2.0 Lyophilizer w/ 16-Port Manifold . New Life Scientific, Inc.
yellowing and a clean look and guaranteed to meet manufacturer specifications. and calibrate the system so you will get excellent performance on day one. system to ensure that it would be running perfectly when it enters your lab. worrying about heat loss issues. down that part of the compressor, but evidence of this is minimal in this freeze dryer. Check the pictures to see the details for yourself. that you can see in the 11th picture of the gallery. 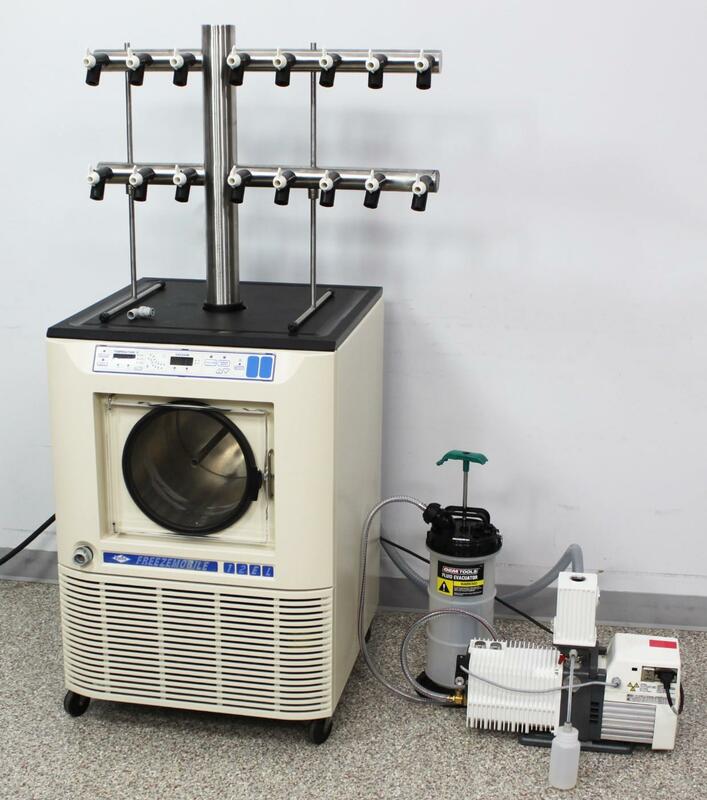 Overall, this freeze dryer was well taken care of and will look great in your lab. without pressure failure ruining your samples. be protected in case of breakdown. into the vacuum pump makes pump maintenance even simpler! refilled the system with new refrigerant. lowest system vacuum is ≤15mT and this system achieved 11mT with the included pump. start freeze drying with this system. With the included 16 valves, you can use the full capacity of the 16-port tree manifold. pump oil remarkably clean and efficient. to collect ice at an hourly rate or over a specified period will always be application dependent.